Gergana has completed a bachelor degree in Marketing from the University of National and World Economy. She has been with the STF team for three years, researching malware and reporting on the latest infections. This article presents you more details on Chairgaubsy.com redirect and provides help for the removal process of all suspicious and potentially undesired files from the affected system. Chairgaubsy.com is the domain of an annoying browser redirect that could unexpectedly load in your preferred web browser. This may be a result of an unattended installation of any potentially unwanted program. The appearance of this browser redirect could be also a signal that some of the major browser settings have altered without your knowledge. Short Description A questionable wesite that interrupts browsing sessions by loading in the browser. Symptoms The main page of Chairgaubsy.com appears in your preferred web browser. A pop-up urges you to allow the display of bogus notifications. Your browser is slowed down by the display of many online ads. User Experience Join Our Forum to Discuss Chairgaubsy.com. Browser redirects like Chairgaubsy.com usually access commonly used web browsers (Chrome, Mozilla, Explorer, Safari, Opera, Edge, etc.) after the unattended installation of potentially unwanted programs. How such programs could land on your device is as a part of software bundles. The installation of PUPs usually occurs during the installation of desired freeware applications. The process could happen without your knowledge as the installers are usually designed to conceal the presence of extras. And since the extras could be set to install by default along with the primary app at the ends of the installation process you could end up with a running undesired app on your device. As a good security practice, we recommend the choice of installers’ Advanced/Custom configuration option. This practice could provide for the security of your device and prevent undesired apps from accessing your system as there you could sometimes reveal the presence of PUPs and opt out their installation. Chairgaubsy.com is an annoying website that interrupts your browsing in an attempt to trick you into allowing it to display notifications in your browser. This it is classified as undesired browser redirect. Since its appearance in the browser may be caused by an undesired program you have unnoticeably installed on your computer, you should scan it for running suspicious and potentially harmful files. Additional issues that may occur soon after you see how Chairgaubsy.com loads in your browser are modifications that affect main browser settings such as start page, new tab page and default search engine. They may be all hijacked by a questionable search engine. All of the above mentioned details could serve Chairgaubsy.com’s owners for their aggressive advertising campaigns as well as for money revenue. Eventually, you may become a target of many annoying online advertisements. At worst data of yours may be sold to third-parties of unknown origin which may include hacker collectives as well. To sum up, Chairgaubsy.com is a bogus website that disrupts your online security and further puts your system at danger of malware infections. So this redirect along with all installed files that are associated with its presence need to be removed from the affected system as soon as possible. 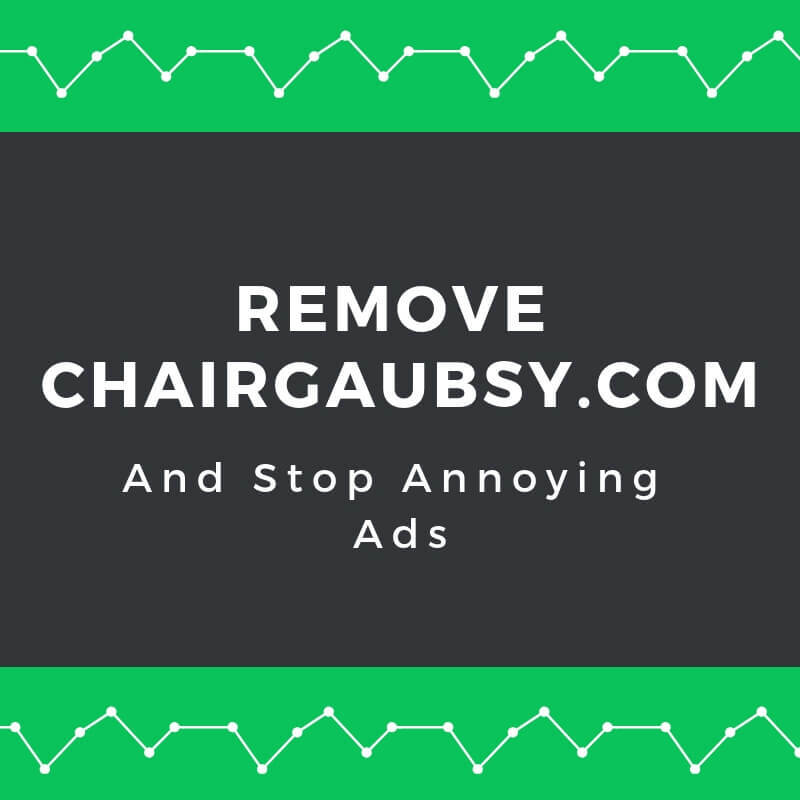 In order to remove Chairgaubsy.com redirect and all associated files that enable its appearance in the browser, you need to pass through several removal steps. They are all presented in the removal guide below. The guide enables you to choose between manual and automatic removal approach. Our advice is to combine the steps as this way you will be able not only to get rid of this particular undesired program but also strengthen the security of your device. Have in mind that installed files associated with this redirect may have different names than Chairgaubsy.com. In case that you have further questions or need additional help with the removal process, don’t hesitate to leave a comment or contact us at our email. Threats such as Chairgaubsy.com may be persistent. They tend to re-appear if not fully deleted. A malware removal tool like Combo Cleaner will help you to remove malicious programs, saving you the time and the struggle of tracking down numerous malicious files. Threats such as Chairgaubsy.com may be persistent on your system. They tend to re-appear if not fully deleted. A malware removal tool like SpyHunter will help you to remove malicious programs, saving you the time and the struggle of tracking down numerous malicious files. Note! Your computer system may be affected by Chairgaubsy.com and other threats. SpyHunter is a powerful malware removal tool designed to help users with in-depth system security analysis, detection and removal of threats such as Chairgaubsy.com. 1. Install SpyHunter to scan for Chairgaubsy.com and remove them. 2. Scan with SpyHunter, Detect and Remove Chairgaubsy.com. Ransomware infections and Chairgaubsy.com aim to encrypt your files using an encryption algorithm which may be very difficult to decrypt. This is why we have suggested several alternative methods that may help you go around direct decryption and try to restore your files. Bear in mind that these methods may not be 100% effective but may also help you a little or a lot in different situations. Note! Your computer system may be affected by Chairgaubsy.com or other threats. Remove Chairgaubsy.com by cleaning your Browser and Registry. Fix registry entries created by Chairgaubsy.com on your PC. Combo Cleaner is a powerful malware removal tool designed to help users with in-depth system security analysis, detection and removal of threats such as Chairgaubsy.com. Step 5: In the Applications menu, look for any suspicious app or an app with a name, similar or identical to Chairgaubsy.com. If you find it, right-click on the app and select “Move to Trash”. Step 6: Select Accounts, after which click on the Login Items preference. Your Mac will then show you a list of items that start automatically when you log in. Look for any suspicious apps identical or similar to Chairgaubsy.com. Check the app you want to stop from running automatically and then select on the Minus (“–“) icon to hide it. Remove Chairgaubsy.com – related extensions from your Mac’s browsers. A pop-up window will appear asking for confirmation to uninstall the extension. Select ‘Uninstall’ again, and the Chairgaubsy.com will be removed. When you are facing problems on your Mac as a result of unwanted scripts and programs such as Chairgaubsy.com, the recommended way of eliminating the threat is by using an anti-malware program. Combo Cleaner offers advanced security features along with other modules that will improve your Mac’s security and protect it in the future. Hey !, I found this information for you: "Remove Chairgaubsy.com Redirect". Here is the website link: https://sensorstechforum.com/remove-chairgaubsy-com-redirect/. Thank you.